This year I want to start keeping a proper troop diary. I also keep a handwritten diary, which I keep in my helmet bag which I write down the basics of the troop, roughly how long I was in armour and also any damage sustained. I also tend to write if anything special happened. For those who are interested it's a leuchturm 1917 notebook and I use a TWSBI Eco fine filled with Iroshizuku Take-Sumi (black) ink. Yes, fountain pens are still a thing. So before I get started for 2017, which sadly won't be anytime soon, I figured I'd back fill 2016 from my diary. This was my first troop so the morning was spent doing my Garrison induction which comprises of a safety briefing (especially important at this troop given the size of the con) and then spotting for the other troopers. My first patrol was with 4 TKs and Chewwy. This was an amazing introduction to trooping, the chewy was amazing in character and the attention as just incredible. My second patrol was with some of our Reel Icons, I escorted Iron Man and Black widow. If you think TK field of view is bad, try Iron Man! After lunch I was finally branded and became a full member of the UKG. I did a couple of patrols but was constantly having issues with my sound setup and gave up on that in the end. I ended up cutting my 3rd trip out short due to the thigh rubbing on my knee causing me a lot of pain. Part of the briefing is "don't be a hero" so I indicated to head back in. I finished up the day with 1 more session spotting for some other troopers. Due to unforeseen circumstances this feel through after we arrived, but as we had all shown up it was counted. My 2nd real troop and also my first celeb photos. Again I had a few issues with my sound but a small bit of tape to stop wires moving seemed to fix it. I also experienced my first armour damage, a crack in the shin at one of the corners. This was fixed after the troop with CA glue and a bit of scrap ABS. This troop had a small but well stocked signing table. Actors from TFA, Red Dwarf, Game of Thrones and Primeval were there. We had a couple of photo ops with some of them. I also bumped into Andrew Lee Potts from Primeval in the car park. My wife had met him at London ComicCon whilst I was trooping and along with a producer had had a nice chat so I thanked him for making her day. Pretty fun troop which was part of the launch event by Disney for the Rogue One merch. We were non stop the whole troop as the store is in a busy shopping centre and the kids (all ages) really loved to see us. Was also the first time my own girls got to see me "at work". We also got given some rare trading cards for taking part. Several of the MCM troops run twice a year, the London event is one of them. As usual this was an early start for me to get down to London in time to kit up and patrol the queue of people as they arrive at the event. We hit the floor at about 8:30am and other than about 45mins for lunch I was in armour all the way to 5pm. I knew all about it the next day. Armour did a grand job, the only issue was I did a poor job of a crack repair which gave up again. I've done it properly with "poor mans fibreglass"* now which should hold far better. Trooping a big con like this is very different to smaller cons. You get far less younger fans and there's far more people who will try and be "funny". As always the spotters did a fantastic job keeping the peace and ensuring when big crowds gathered round us we were safe and everyone was able to just enjoy themselves. After lunch I took part in a presentation of a £15,000 cheque to the Royal British legion and also a wedding proposal. Both firsts for me and very cool to be part of. In the short gap between the presentation and proposal the infamous Office Billups kept the crowd by getting up some younglings for photos with the assembled might of the UKG and Reel Icons. The first of who, which he didn't know, was my daughter in the Sabine costume I made for her. After the photos were done my wife and daughter had vanished. After asking my CO if he'd seen them and explaining why I was marched round the hall by the event co-ordinator only to find them where we started. MCM Comic Con London October by Christopher Pearson, on Flickr (if you look carefully you'll see the TRamp master himself). All in a great day, MCM really is a baptism of fire for the several new recruits it attracts but there's just something about it that will keep me coming back. *cut up t-shirt and superglue. That makes the end of my sadly far too short catch up. Hopefully I'll manage to be a bit busier this year but at the moment first troop this year looks to be the same as the last. Whilst not the biggest or longest of troops this was a bit of a special location : Elstree Studios. Was a very short notice troop, only a weeks lead time. There were 3 TKs (My CO Gary, Rob and myself) as well as Steve to spot (also our EA). The brief was simple, meet and greet the guests to the gala. We did this for around an hour, lots of happy big kids asking for a "photo for their grandson/daughter"
The changing room was nice, we were given a dressing room suite. A bit nicer than the usual back room or tressel table. Yes, thats Rylan on the wall yes it was a major subject of disccussion. Sadly we didn't get a photo next to Stage 1: aka the Gorge Lucas stage. I think we did get a photo with the studio sign in but I need to get it from Steve. If I get it I'll update this post. This one was a must for me as one of the charities supported by this fair is the hospice who looked after my mum for her last week or so. We started by taking part in a parade. This was lead by a piper band and a dray with the May Queen. We followed this. There was also around 10ish floats from local schools and clubs, a tractor parade and some vintage cars. It was quite impressive to see such a turn out for a local fair. After the parade we went to see some of the floats which were Star Wars themed, a Millennium Falcon by the Scout group and an AT-ST, not sure who made that one. This children suitably high-fived we proceeded to do laps of the event and continued with the high fives and photos until our time was over. This was a fun one. The call came in that Warwick Davis wanted a lot of TKs for a festival he's a patron of. Despite being a bit of a peak period the UKG provided a number of fine TKs along with a selection of TIE, TIE Reserve, Shoretroopers, Imperial Guard and an Ewok (because why not). Rebel Legion were also invited and provided a selection of X & Y wing pilots, ROTJ rebels, a Jawa and an ANH Leia. Warwick was on stage speaking to the crowd when the garrison was deployed to interrupt him. After a few sketchy moments getting up the wet steps we marched on to the stage whist Warwick talked Star Wars for a bit. The crowd was pretty large and the response to our appearance was really good. After the stage appearance we made our way into the event arena for the usual meet and greet mix of high fives, selfies and arrests. This was a new event for us but really was an excellent day. Whilst I didn't get to meet Warwick properly, I just stood behind him for 10 minutes, due to timings not working out it was awesome to be able to take part. I am hoping this one becomes a regular in future. Added 2 more photos to troop #8. I'm actually about 2 or 3 troops behind, I need to catch up. Time to catch up on last year before this year starts up again! Another season another MCM Comic Con London. This was my 1st Anniversary troop and as such something I'd been looking forwards to for a while. It was also the second outing for my daughter as Sabine (Season 2 version). She was apparently very popular and some of the Rebels guys in the 501st and Rebel Legion grabbed her for a photo. As for me it was mostly business as usual for a big con. Out at 8:30ish done by about 6. This year was pretty hot and I'd not drank enough the day before so I took the opportunity to spot for a while before and after lunch time. I did a couple more hours in costume to end the day. What was quite fun was David Prowse was signing at the event so I popped over to get my Black Series Figure signed. As we all know this now was one of the final few signings that he did. Not 501st but Reel Icons: this was the first event where a fellow 501st member debuted his Johann Kraus from Hellboy 2. This costume is a thing to behold. The detail and smoke effects are amazing. I'd been following this build for ages so it was awesome to see it in person. This was a short one for me sadly. Was a great morning at this smaller con but just after lunch I was forced to leave for personal reasons. The morning however was great fun, and I got to meet some new members I'd not before as well as exchange nods with Jon Campling, a death eater from The Deathly Hallows. If you know me is pretty cool as I am working on a Death Eater costume. No Photos for this one unfortunately. This was an unexpected one to round out the year. A local event to celebrate the achievements of Kids in Care. Was a nice troop in a theatre where we got our own dressing room. We patrolled the public areas of the theatre as the Kids arrived giving high fives and posing for photos. Once the event started we headed back to the dressing room and let them enjoy their evening. Wow Chris, that's a fantastic read and achievement too. Great pics too ..... just can't wait for my first outing. Love the idea of the troop diary, I bet when you look through it, Andrew this thread too, it brings back some wonderful memories. There usually is a few taken over the weekend. The Excel gets stupidly hot so a trip or 3 outside is really common, also it usualy give us some room to move. I think the 2 above are actually press ones, I know the one where I am guarding Leia was for sure. If you can ever make it over I am sure you'll be looked after, MCM run several big cons a year and the 2 each in London and Birmingham are our 4 biggest events each year with about 150-250 costumers on each day. Great photos, keep ‘em coming. Maybe don’t wait ‘til 2019 for the next update. Thanks for sharing your Troops Chris! Late or not, they were stellar write-ups and making me wish I could make it across the pond to visit! Another year another London Comic con, though this year under Reedpop ownership. Whist now very familiar there was definitely a slightly different feeling this year, neither good or bad just different. 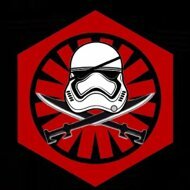 The UK Garrison/Reel Icons had approximately 100 members attending plus members from the invited clubs: Rebel Legion, R2 Builders, UK Preditors, Colonial Marines and the 15th Cyber Legion. Lots of familiar faces and plenty of new ones. On the Saturday we welcomed 5 new recruits, and I believe there was a further 5 inductions on the Friday. We shared our stand space with UK Garrison, Reel Icons, Rebel Legion and Jedi News all having tables, there was also a R2 builders display. The colonial marines were mostly gathered by Terry English's stand, as he was the maker of the marine armour in Aliens and all round lovely chap. It was certainly as busy as always. Once the general admissions opened it was crazy busy, and stayed that way almost the whole way to the close of the show at 7pm. Our club stand was packed for most of the day with only small lulls. Most of the day was spent either on patrol outside the venue near the fringe festival or on the club stand. The heat was worse than normal as was the humidity making breaks essential. Spotters were doing sterling work getting us on and off the floor ensuring we could get in for lids off at a moments notice. This was the first time I managed to run out my helmet fan battery and I didn't have a spare that would fit. I did manage to get some more charge back into it from a phone charger battery which was enough to last out the day. In all it was a fantastic day, and I am already looking forwards to the Autumn con. This is doubled as I won't be able to go next May due to a family wedding. Images to follow if I can get any, the down side to not taking the armour off all day, but for now heres an idea of whats MCM is like. This is the North hall at roughly peak capacity, there is also a South Hall that was apparently busier and the fringe festival outside the venue (if you came to CE the festival is down the steps where the photo was taken). You can see our stand in the beginning of the video. Update: Looks like the charity buckets did well raising £2181.30 for Mitchell's Miracles. That looks crazy busy brother - I might have to make a trip over to Troop with you too! We often have people from other Garrisons come and join us for these. I think there was 2 or 3 this year. If anyone has the means to come to one of these I would whole heartedly recommend it, we'll even let you at the Haribo.